Home > Commercial-Land Mobile-Marine > MOTOROLA > HNN9018 : 7.5volt 1500mAh rechargeable Ni-Cd battery Motorola Radius SP50 radios, etc. HNN9018 : 7.5volt 1500mAh rechargeable Ni-Cd battery Motorola Radius SP50 radios, etc. 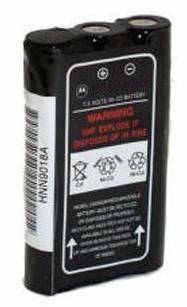 HNN9018: 7.5 volt 1500mAh NiCd battery for Motorola SP50, SP-50 radios, etc. Can be slow-charged or fast-charged. Replaces original # NTN9018. Battery is approxiomately 3.5" tall. HNN9027 : 11.25 volt 600mAh rechargeable Ni-Cd high-power battery for Motorola RADIUS P50, P10, etc. HNN9027 : 11.25 volt 600mAh rechargeable Ni-Cd battery for Motorola RADIUS P50, P10, etc. Replaces original # NTN9027A, NLN9027(A), HNN9027A, etc. HNN9027h : 11.25 volt 1100mAh rechargeable NiMH battery for Motorola RADIUS P50, P10, etc. 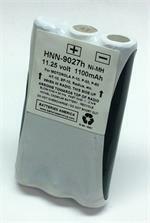 HNN9027h : 11.25volt 1100mAh long life rechargeable Ni-MH battery (high power) for Motorola RADIUS P50, P10, etc. Replaces original # NTN9027A, NLN9027(A), HNN9027.